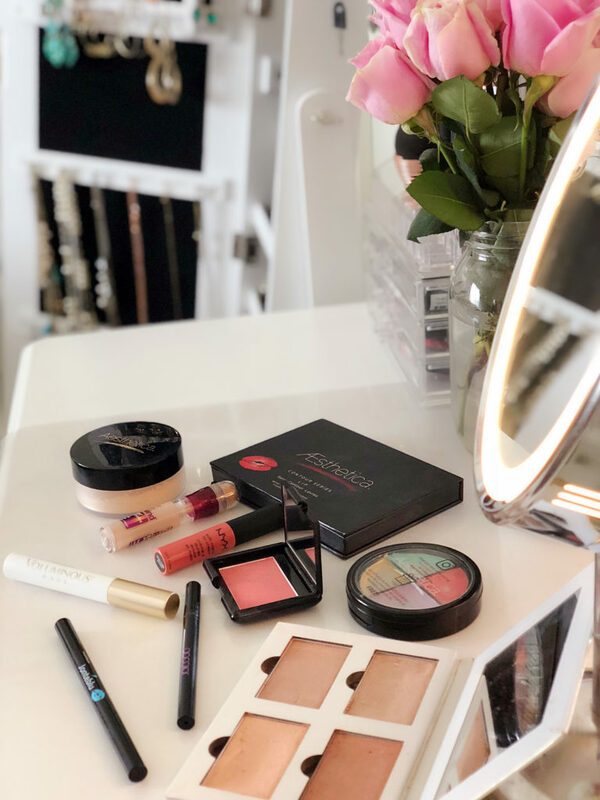 Having a makeup vanity (aka dressing table) is a game changer for any woman who loves makeup, luxurious glam time, and having her life together. I got my first vanity (after years of wishing and dreaming about getting one) the first time I lived on my own, about 2 years ago. I initially got the vanity table because I thought it would help me stay organized and get ready more easily in the mornings. But little did I know, my makeup vanity upgraded my life in a major way (shout out to Doug for putting mine together for me…twice!). 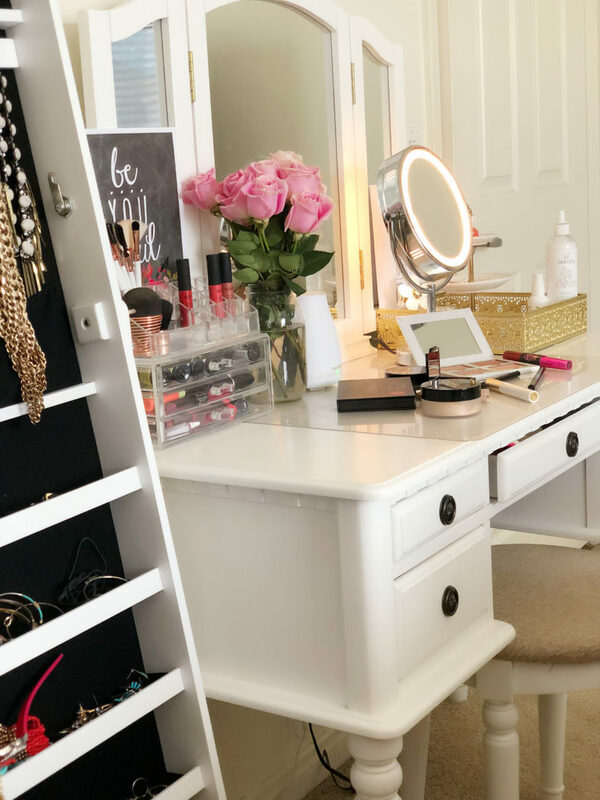 Vanity’s are not only a space for you to get ready, but they can also double as extra storage space, a writing desk, extra seating space, a place to practice your favorite self-care routine and more! I firmly believe that every woman needs a makeup vanity table in her life, so today I’m making the case + sharing some of my favorite vanities (between $100-$800), and vanity organization tools to get you started. You don’t need a lot of space or money to incorporate a vanity into your bedroom or office, so say goodbye to getting ready at your bathroom sink and say hello your new well-lit, glam station. 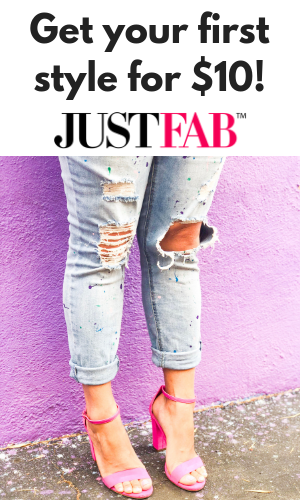 Scroll to the bottom of this post to enter the $1,000 Nordstrom giveaway! Whether or not you like doing your makeup or hair, wouldn’t having more peaceful mornings make your life a little bit better? My vanity has helped me streamline my morning routine, which makes my mornings so much less hectic and starts my day off on an amazing note! Before I got my first makeup vanity for my bedroom a few years ago, my morning routine was a bit of a mess. I’d get ready sitting on the couch watching TV, sitting in the bed watching TV or at the kitchen table in poorly lit spaces. It took me forever to get ready, I was always making a mess and my lack of consistency was inefficient and stressful. Now every morning I wake up and sip my tea at my vanity desk, do my makeup (with my favorite LED lighted vanity mirror), touch up my hair (with my favorite $20 hair straightener), pick out my jewelry and spritz on my perfume. 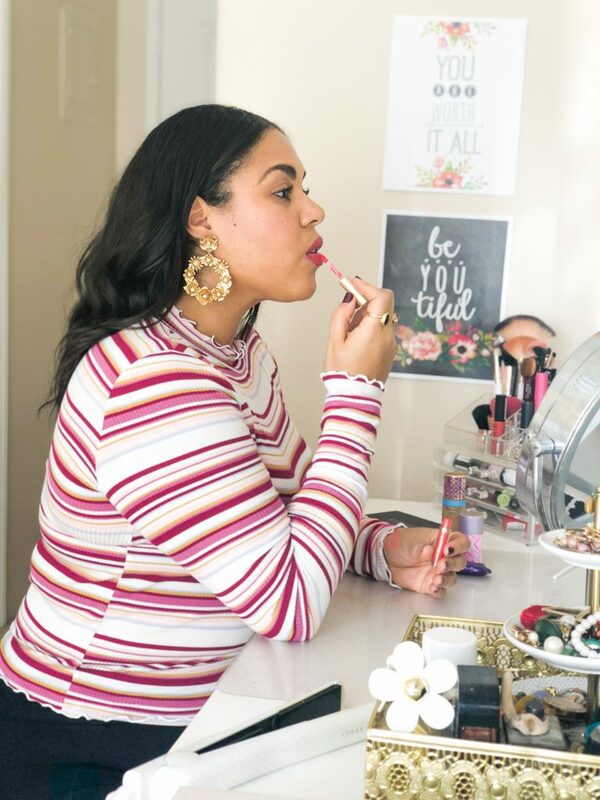 It puts my mind at ease to have a dedicated space to get ready, practice my beauty routine, and take care of any other self-care to-dos on my list before my day gets started. Ever dump out your makeup bag to find tons of products you completely forgot you ever owned? Having a vanity prevents this by neatly displaying and organizing all of your beauty products, meaning you’ll actually USE your precious beauty goodies. 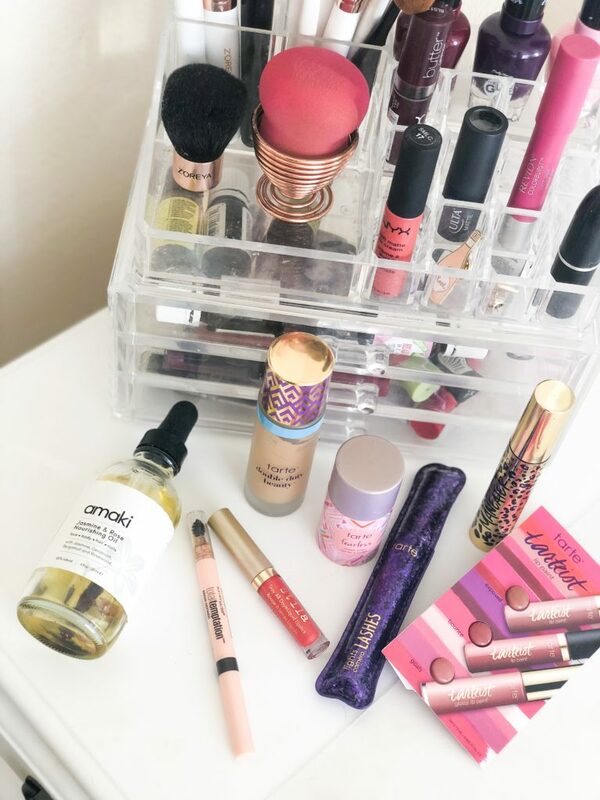 Before I had a vanity, all of my makeup products were shoved into a medium-sized makeup bag, and any of the products that couldn’t fit would sit lonely in random drawers in my bathroom. With a vanity, you get specialized drawers built into your table (with most sets) and counter space to set up organizational boxes to put all of your glam essentials! 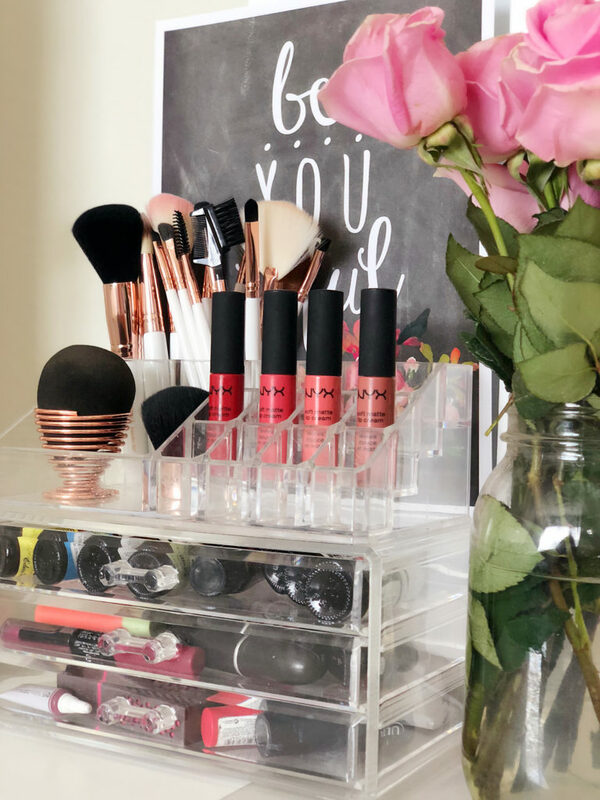 These acrylic organizers and drawers are my favorites! You can also get a brush holder, makeup sponge holder, jewelry organizer, perfume tray and an LED lighted mirror to have your vanity looking like a slice of paradise! 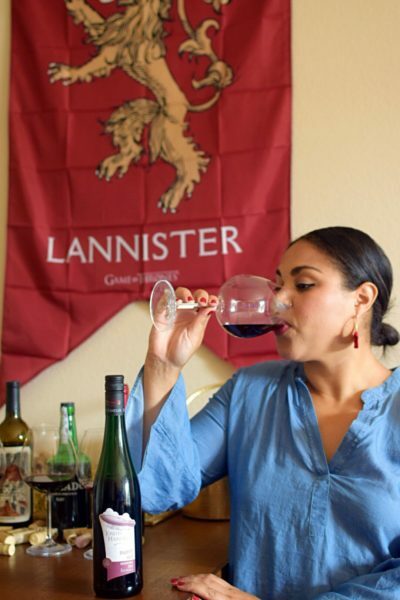 Whether you’re living in a small apartment or a mega-mansion (or somewhere in between), you should always look for ways to maximize your space. Having a vanity in a small space, in particular, is an easy way to add extra seating to your room. I live in a smallish 2 bedroom apartment and have my vanity table with chair (which slides under the table when not in use) in Doug and I’s bedroom. The vanity is the perfect addition to the room where both Doug and myself (and any guests) can take a seat in our bedroom. I love having this extra seating option in our room, and it fits much better than having an extra couch or loveseat, which would make the room cramped. You don’t need a big space to have a vanity, and I am proof of that! Get creative with your space and find a vanity table that fits and adds value to your room. I love this vanity and chair set, and this one is also perfect for those with a small space. 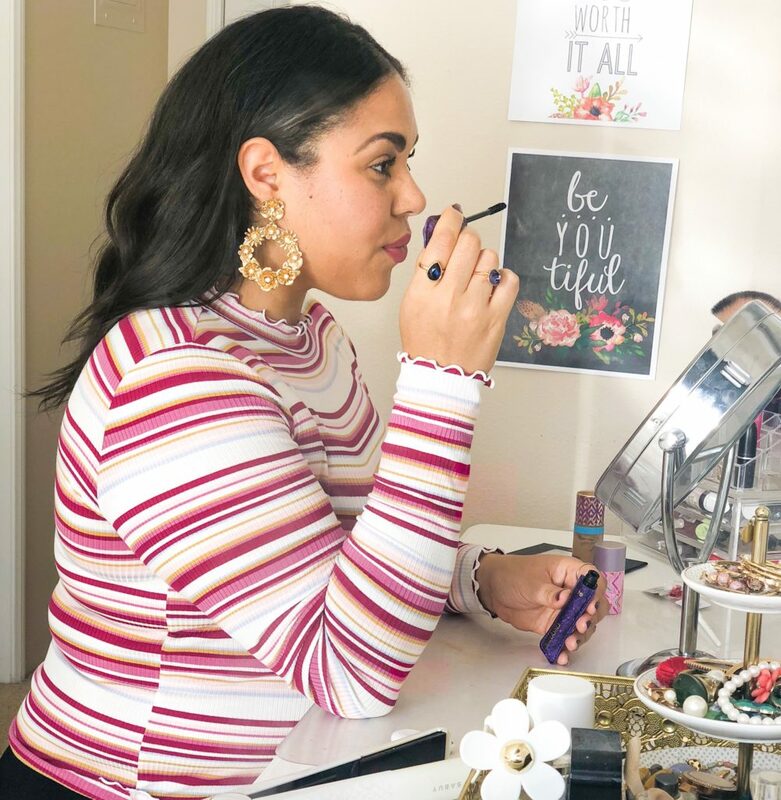 As I mentioned earlier in this post, your vanity table can function as your makeup station, your self-care station, a desk, a reading nook, extra seating space in your room, or all of the above! I love using my vanity as a writing table, nail salon, hair station, glam spot, and to watch TV when I don’t feel like sitting in the bed. You can utilize your vanity in an endless number of ways, which makes them even more worth it! I talk a LOT about self-care, but that’s because I truly believe in its healing powers. As a woman with PCOS (more on that here), self-care is one of the core tenants of wellness in my life, and my vanity set up has really helped me prioritize this essential healthy habit in my life. By having a dedicated space to focus on all things you, you’re saying “I’m worth it.” Take a little time to sit down, look at yourself in the mirror, appreciate all that your beautiful-self has to offer, pamper yourself, diffuse some essential oils, or just do whatever it is that makes you feel good. If you’re looking to upgrade your self-care game, getting a vanity table is a great first step. 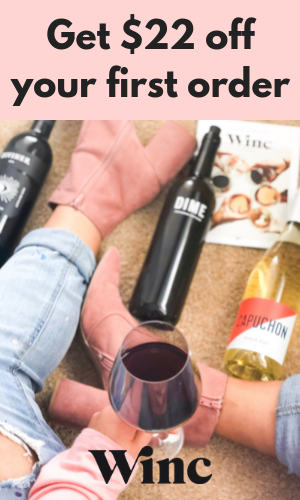 Click here for more self-care tips and ideas. So what do you think? Will you be adding a makeup vanity table set to your life? If you have one, I’d love to know how you like it!